Introduction – Omkareshwar is about 87 km from Indore and takes about 3 hours via bus. Omkareshwar is one of the joytir-lingas among the twelve hence considered very sacred for Hindus. On above of this, it is located on the banks of Narmada river, which is also considered very sacred for Hindus. The infamous Sardar Sarovar Pariyojna on Narmada river is constructing a dam near Omkareshwar only. This small temple town is situated on both the sides of Narmada banks, making Narmada like a lifeline of the town. However, the main island is sprawled along the southern bank of the Narmada. Barely four km by two km, the island is composed of two hills divided by a shallow valley; the contours thus formed give it the shape of Om, the holiest among Hindu symbols. The town is named on this symbol formation. The island, also called Mandhata, can be reached from the town across the river by a cantilevered bridge or by a ferry. This island is oriented around the main shrine of Omkareshwar, religiously and commercially as well. Monuments – There are not many monuments of interest in Omkareshwar, in architectural sense, however you will find many modern religious shrines in the town. 1. Omkareshwar Temple – This shrine can be seen from long distance attributed to its white high rising spire. It is built on the edge of a cliff overlooking river Narmada. The core of the existing temple is perhaps built by Paramaras in 11th century as seen by its Bhumija style of spire. The most of the present shrine is built quite later, in the 19th century by Holkars. This is a three tiered temple, where Shiva linga is placed on the lowest level. There is a Panchamukhi Ganesha shrine on the next level. The uppermost level has Annapurana shrine. The pillars of the mandapa are carved with sculptures and yaksha capitals. This is the only jyotirlinga where the linga is not of proper shape or better say shapeless. You can take photographs inside the mandapa but not of the sanctum. Siddhanatha Temple – There are many temples scattered around the hill, most of those are recent structures. However, Siddhanatha temple, located on a high plateau up on the hill, is of 11th century construction and in much of ruins. It looks like a rubble of stones, carelessly put at one single place. Yes, there is a MP Archaeological and Museum Department board of protected monument however there is no protection given to this shrine, even there is no enclosing boundary. Many of its stones are taken by villagers and put inside their local shrines nearby. All the guidebooks talked about very magnificent elephant frieze in relief, however all my efforts failed to locate such a frieze within the temple site. However I was able to locate such a relief in nearby vicinity, in a local open-air temple. Yes, indeed it is an exquisite relief carving showing an elephant with a rider under a makara -torana. Restoration of this temple can be done as many of the stones are still in their original form, however I do not see any activity of such a sort in near future. Food and Accommodation – Though Omkareshwar is a small town, but it is very much frequented by tourists. The accommodation options are basics only. The island has many dharmashalas where you can get basic accommodation facilities. The mainland has some guesthouse, however the facilities are still very basic. Om Shiva Restaurant is a good option for food, it serves only vegetarian of course. 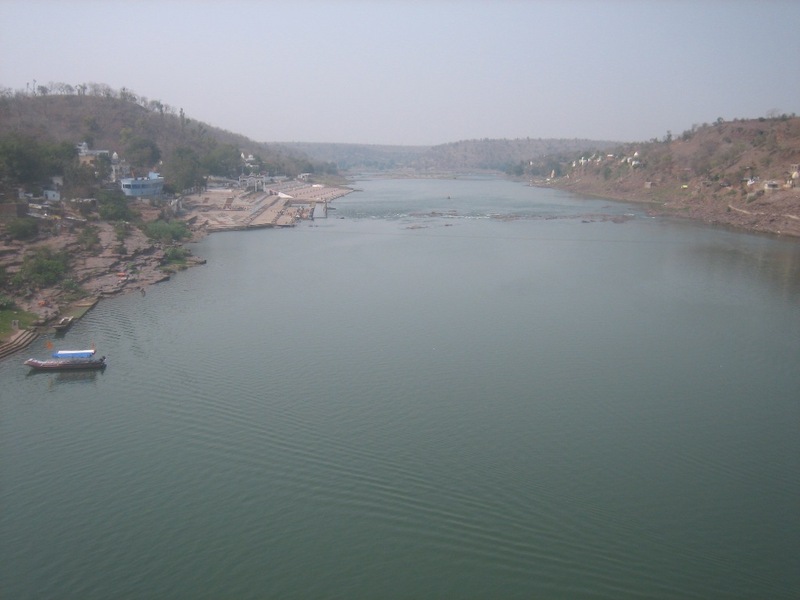 How to Reach – Omkareshwar is located about 87 km from Indore and is well connected via buses from there. Bus from Indore takes about 2/2.5 hours. It is also connected with Ujjain and Maheswar via road. The nearest rail-head is Omkareshwar Road, which is about 10 km from the main town. A trip via rail will be most enchanting in rainy season when the rail-line cuts through Vindhyachal ranges giving the best view of the nature and green scenery. Indore is the nearest airport and main railway station.